Best deals at the Bristol Sound & Vision Show 2018 | What Hi-Fi? One of the benefits of attending the Bristol Sound & Vision Show? Why, discounts and deals of course! Now in its fourth decade (after celebrating 30 years in 2017), the Bristol Sound & Vision Show is the biggest it’s ever been - and the place to see the latest hi-fi and home cinema products, from Arcam to Cyrus and Q Acoustics to Technics. Visitors can enter the What Hi-Fi? competition, with prizes totalling over £11,000, including the Naim Mu-so system, Rega Brio amplifier, KEF Q350 speakers, Arcam rPhono phono stage, Cambridge Azur 851N streamer, AKG N60NC Wireless headphones, and plenty more. There's also a special What Hi-Fi? offer, with the choice of a pair of Beyerdynamic Byron headphones (worth £50) or Chord Company Clearway interconnects (£90) if you subscribe. 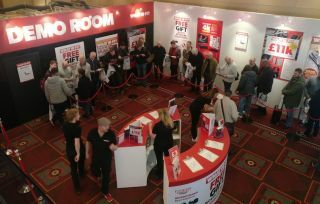 Firstly, there is 15 per cent off most items over £100 sold through the show sales desks. (Exclusions apply, please check the posters in the sales areas. Discounts do not apply to any of the show special offers below).